Hastings Online Times – Parliament or prison? 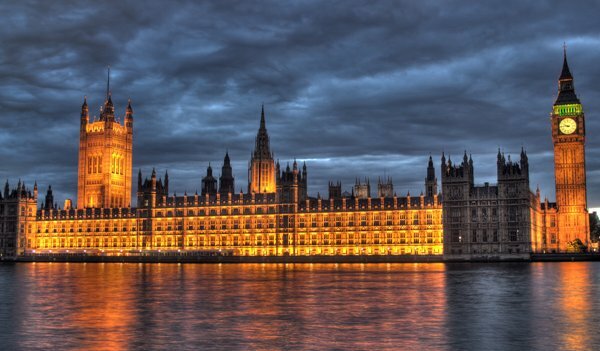 Parliament – the right destination for our MP if re-elected? asks the writer (photo: Maurice of Zoetermeer, Netherlands/Wikimeda Commons). Under Britain’s outdated undemocratic political system, voters have no say on whether or not to wage war, but we do have a say on whether or not to re-elect warmongers to Parliament. If Britain is attacked by the military forces of another State then the decision to defend the nation from attack is a no-brainer. Parliament must do all in its power to stop the attacks, repel the attacker and settle the causes of the conflict peacefully. This is the only occasion in law when the use of armed force is legal, and so this is the decision we expect from our MPs. If on the other hand Britain is asked to join an armed attack on a UN member state, an illegal act of aggression, then we expect MPs to uphold our treaty commitments, reject the invitation outright, and, if asked to do so by the UN Security Council, to send Britain’s military forces to help defend the attacked State from its attackers until peacekeeping measures are put in place. Here is the recent record on key war votes of our MP, leading Tory colleagues and leading politicians of other parties. Unfortunately MPs have little or no understanding of the laws and treaties governing war and the use of force. Although Britain has made binding agreements never to wage war, never to threaten or use force, never to interfere in other States’ affairs, never to fund the fatal use of firearms or explosives, never to kill a person because of their nationality, to settle all disputes peacefully, to respect human rights, to uphold and enforce the rule of law and co-operate with every State in a spirit of brotherhood, we repeatedly break every one of these laws and commit the world’s worst crimes at every opportunity. Why? Why do we believe our leaders when they tell us that our wars and the murder of thousands of men women and children are legal? Every MP is aware of the horrific consequences and atrocities of war. They know that bombing and killing men, women and children is a crime of murder, so why do they do it? To vote once in favour of war might possibly be explained away as an error of judgement, but to do so on five successive occasions, knowing that thousands of civilians will be killed, is not only a crime of conspiracy to murder, but it indicates a total lack of compassion and human feeling. The same principle applies in the general election. To vote once for a candidate who favours war and mass murder over peace and reconciliation might be explained away as a mistake or an error of judgement on your part. But to vote for them on a second or third occasion shows that you support and approve of their decisions and actions and you consent to the commission of further such atrocities in your name? Is this what you want? When she was re-elected as MP for Hastings and Rye in May 2015, Amber Rudd was already jointly responsible for the murder of 100,000 Afghani, Libyan and Iraqi adults and 25,000 children. Since then, she and her colleagues have authorised more than 200 armed attacks on undefended targets in Syria which have led to hundreds of deaths, innumerable injuries and the exile and destitution of millions. Not one of our victims was given the chance to defend themself or their family in court and none was shown mercy before they were brutally injured or killed by command of our elected MPs acting in our name. On June 8 we choose who will govern Britain. If you choose to re-elect a warmonger to Parliament, then please remember that as a taxpayer and elector you are knowingly supporting, endorsing and financing their decisions to wage war, which will make you complicit in their offences and criminally liable for prosecution as an accessory to murder and war crimes. Whoever you vote for on June 8, there is one further thing you can do to hold our leaders to account for their involvement in illegal war and the murder of civilians: you can phone 101 and report all those MPs who voted for war to the police for conspiracy to murder. Then it will be down to law enforcement authorities to arrest, prosecute, convict and punish Britain’s leading warmongers for their part in the world’s most serious crimes. For an account of the various treaties and laws outlawing war to which the UK is a signatory, see Chris Coverdale’s Don’t pay taxes to support illegal wars! Thank you for this – very informative. I have emailed it to all my friends and relations.